I know I promised you a house tour, but first, another birthday. Someone turned two last week. I'm back to tell you that the fence turned into a fish. Not only that. A dragonfly landed on the porch. Seemed like a good time for me to come out of hibernation. It would have been my mum’s seventy-fifth birthday. In early spring, before things took a turn for the worse, Mama had been talking about having a big bash for her 75th. But as it happens, she is gone and her loved ones are scattered around the planet. My father is in transit to Europe, my brother is in Jordan, my sisters are all in different cities across Canada, and I am mid-move (next post: new house tour!). Her friends are also widely dispersed – Montreal, Toronto, Pennsylvania, England. So I thought I would offer up this space as a make-shift gathering place. I can’t say I really believe she would approve of a birthday party on a blog, but it’s all I’ve got. I wish I had more photos to post, but all my albums are in boxes somewhere. 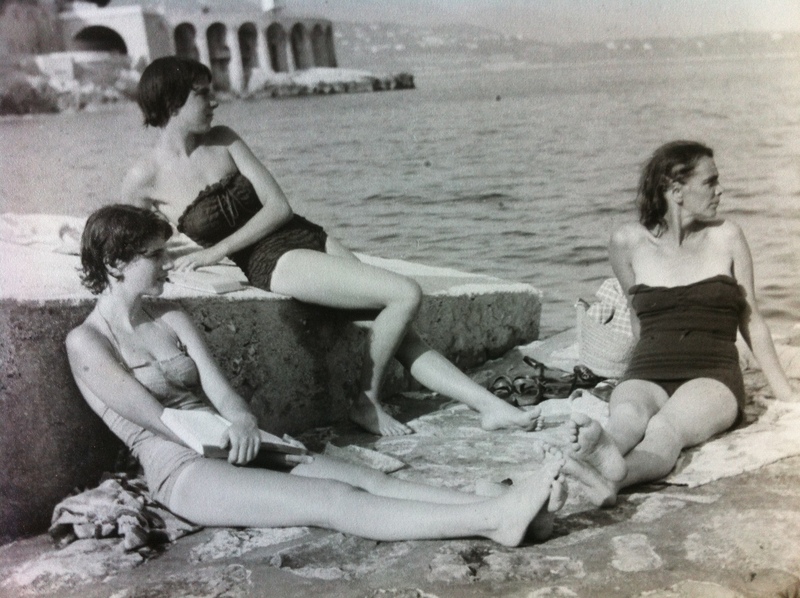 Here is one of my mother, Gabriel (centre), with her sister Jane (left) and her mother Betty (right), a long time ago in Monte Carlo. It surfaced in the summer when we were looking at lots of old photos, and it is so unlike any other photo I have of her I took a snap of it on my phone and carry it around with me. My mum did birthdays exceptionally well. She wrote personalized poems, stacked up gifts wrapped with ribbon and minimal tape (to make re-using the wrapping paper extra easy), made your favourite meal and baked a cake. If you lived far away she always got a card to you on time. And yet, when it came to her birthdays, she never wanted much fuss in her honour. Birthday requests usually amounted to “a few new pens” and “no more books!” (which we almost always disobeyed). Happy 75th Birthday Mama. We sure do miss you. A few days ago, we sent our eldest off to camp for a month. After she’d gone, I was having one of those “what the hell were you thinking?” parenting moments. I’m not so good at goodbyes at the best of times. But to be fair, I didn’t know that this goodbye would be coming so close on the heels of the biggest goodbye I’ve ever had to say. My mother died two weeks ago. My grief is a rogue wave, rising out of the ocean and knocking me down, leaving me gasping for breath. If I didn’t have all these children playing on the beach, it would be tempting to let it pull me out to sea and drift for a while. Almost everything makes me think of my mother. I’m chopping cilantro to put in a salad and I think of how she would send me out to the garden to pick specific herbs and when I returned she’d put them in a glass measuring cup and hand me a pair of kitchen scissors and tell me to chop. A Beatles song comes on the shuffle and I think of how she liked Ringo best, and how she would tell us they were from Liverpool, like her father. I read something in the paper or in a book that I want to tell her about or get her opinion on and the wave rises again. I suppose with time I will become more accustomed to it. It will hit with less impact, or I will become stronger. I don’t know. She was a force, my mum. I had time to ponder the consequences of excess a couple of nights ago. I’d been to the Slow Food Annual Cookbook Exchange, held this year at The Whole Beast Artisan Salumeria. Mmm. There was an array of housemade charcuterie, bread and pickled beans and carrots to welcome us, followed by an impressive five course dinner. It was served family style, each dish brought to the table and served amongst the guests. It was all sumptuous, but there was a lot of meat. A. Lot. I guess I could have anticipated that, heading off to dinner in a fancy butcher shop/deli. Let’s just say I didn’t sleep very well. In the morning I was looking for some sympathy, claiming something had disagreed with me, but as I described the evening’s Rabelaisian proportions Dave offered me a little reality check: “You just ate too much.” I dismissed this statement at first. I’ve never eaten to the point of feeling ill before. And what did he know? The man has the appetite of a sparrow – this is partly why I joined Slow Food, so I could go revel in flavours with other people who get it. But then he drove the point home. Suddenly a light went off. It wasn’t so much about the dinner – deep down I knew he was right. He has a gift for cutting through to the essence of a problem. My little epiphany was more about this time we live in and how so much of what is going on right now is a consequence of excess. I had a yoga teacher who once described something as an elusive obvious, and I think that this is one of those things – a simple truth that somehow gets away from us. It strikes me that perhaps this is the common purpose of all the Occupiers- whatever you may think of them – they do serve to remind us of that elusive obvious; that excess is our downfall. It’s true on all levels. We can ignore it, but there’s really no escaping it. It made me understand why the holiday season so often makes me feel much like I did the other night. Restless, clammy and uncomfortable. It’s turned into a festival of excess in an era that already reeks of it. 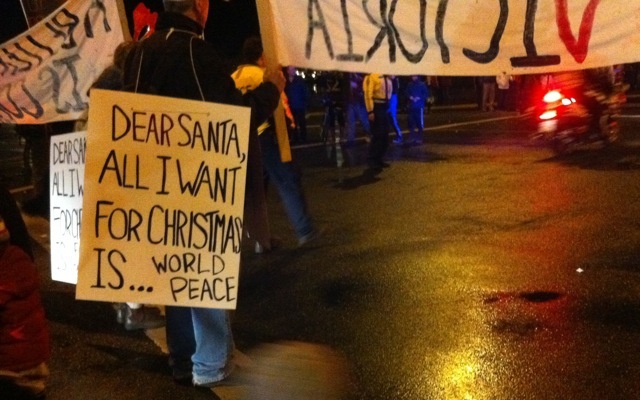 Last Saturday night, a small group of Occupiers quietly strolled down Government St, trailing the Santa Parade by a substantial police-enforced buffer zone. I happened to be standing next to a man in a wheelchair, wearing a Santa hat that had a pin on it which read “Occupy Together”. We struck up a conversation, and he told me it had been his idea for the Occupiers to participate in the parade. “We just want to rebrand a bit, you know – people just think of the tents and drugs now. That’s not what it’s about.” I watched the signs go by. Stop Corporate Santa. Dear Santa, All I Want for Christmas is an End to Child Labour. A Better World is Possible. There wasn’t a one I didn’t agree with. Eighteen years ago, my mother took me to New York for my 16th birthday. It was my first real trip to New York, and one of the only times I travelled alone with my mother. We stayed with old Cambridge friends of hers who live in a penthouse on the Upper West Side and had worked for one of the big publishing houses. As I remember it, almost every square inch of wall in that apartment was covered in bookshelves. We walked through Central Park and went to the Met. We took a long bus ride all the way up through the Bronx to the Cloisters. It was one of those perfect crisp New York fall days, and there were still ripe quince hanging on trees in the gardens. One day we spent a good long time in the Strand, and my mum bought me a collection of Walt Whitman. It was a memorable trip for all these reasons. But what I remember most is how whenever I was starting to flag a bit – getting tired of walking, or looking at art or books, my mum would say it was time to find a bench or a coffee shop and sit down for a bit. She knew just how to pace it so we didn’t overdo it. As I head into the next year of my life, I’m thinking that’s going to be my new goal. To trim the excess. And if excess has an antidote, I think it must be gratitude, so I’m going to start off by saying thank you to my mum. Thank you, Mama. Thanks for giving birth to me 34 years ago. Thanks for raising me and for taking me to New York and for giving me a good sense of direction and for teaching me how to use public transit. I could go on, but I know how to pace it so I don’t overdo it. (Sometimes). The opposite of a still life, which is usually the depiction of inanimate subject matter, my life still offers up a little slice of life, frozen in time. I was bending down at the end of the table one evening after dinner, picking some things up off the floor, when I looked up, my eyes right at table height. 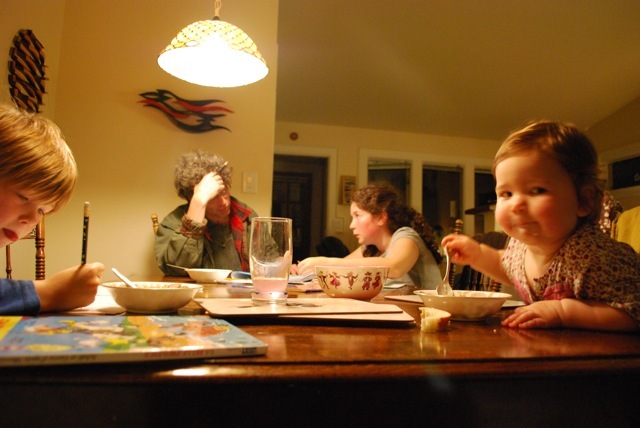 It struck me as such a lovely scene, Dave and Grace working out some math homework together at one end of the table, Jack in his own bubble, drawing, and Eleanor taking it all in while attempting to feed herself some yogurt… My camera happened to be within arms reach, so I grabbed it, thinking I’d capture one of those instances that otherwise gets buried in the memory file, lost among other miscellaneous moments not attached to any large titles. I find the camera useful for that. What do you give a one year-old? I remember when my nephew Ben turned 1, my sister got a big cardboard box and filled it up with ornamental gourds of different sizes and shapes. That’s a gift a baby can really appreciate. I wanted to put a little effort into my fourth-born’s first birthday, but she really didn’t need any stuff. She did need a fall jacket, however, and I had bought some of Anna Maria Horner’s gorgeous velveteen earlier in the year with this very project in mind. As I began cutting out pieces, I pondered (as usual) whether my ambition exceeded my skill level, but was happy with how easily and quickly it all came together. I credit AMH’s excellent instructions (pattern from this book). It’s given me confidence to tackle another sewing project for Christmas, but I’ll save that for another post. A jacket was fine for keeping her warm, but I felt she also needed something fun, and this is where I enlisted the help of the carpenter. 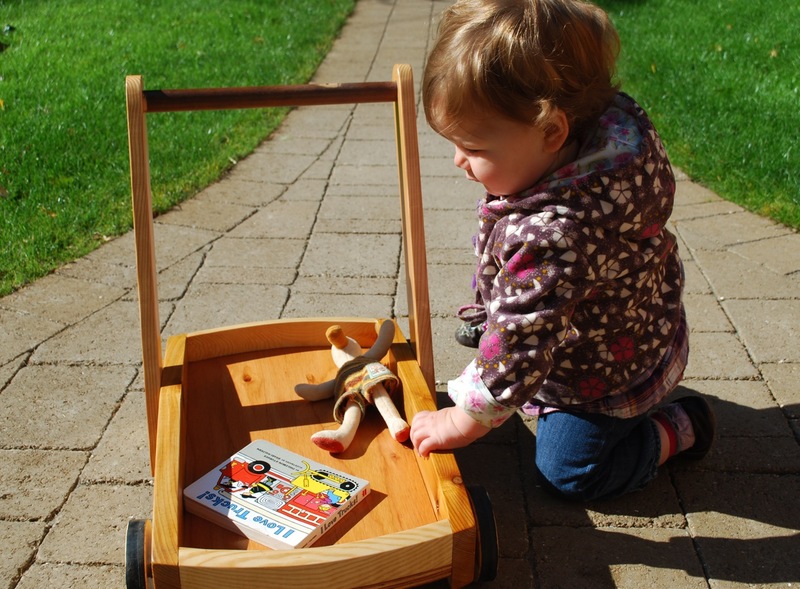 I’d admired the clever wooden wagon that Ella (of the lovely Little Red Caboose blog) had offered her one year-old earlier this year, and thought it was just the thing to help a little toddler around while their steps gained stability. So I put in a request at the workshop, and a few days later the requested item appeared. This post is a little out of date. The one year-old is now almost 14 months old. 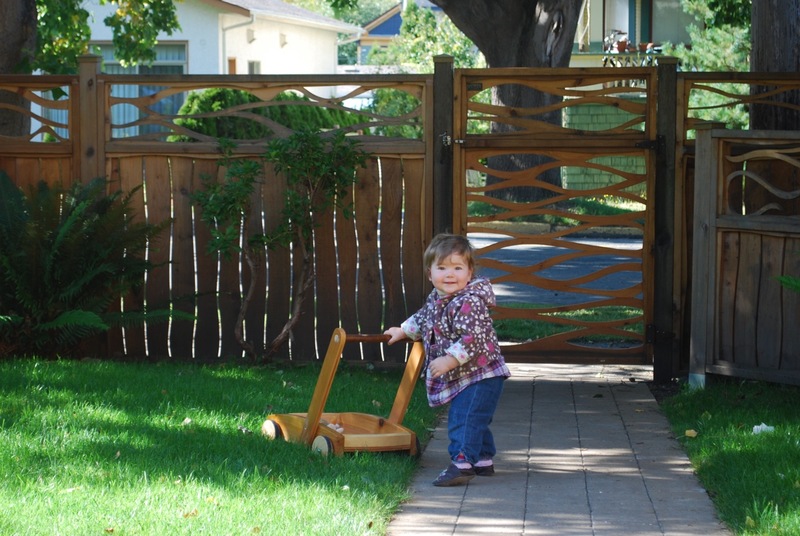 She is walking on her own (now uses the walking wagon to help her run) and is in need of a winter coat. But I’m not going to try and tackle that myself. The holiday project list is getting long… more to come! I guess you could say we live in a fairly artsy neighbourhood. Well, there are a few adjectives that describe our neighbourhood – I’ve also heard ‘eccentric’ used quite frequently. One of the nice things about having a baby in a stroller is that it gives you permission to say things like “What’s this, then?” out loud when you’re walking down the street, and not seem like a crazy person. (I’m quite certain I won’t be able to break the habit of saying things out loud when I no longer have a small child keeping me company, and will then officially join the other “eccentrics” in the neighbourhood, but for now, I’m just an observant mother pointing out things of interest to her offspring.) Yesterday, this giant purse on a lawn was the main item of interest. Clearly more so to me than to my 13 month-old, who, I’m thinking at this stage of life doesn’t understand that giant purses on lawns aren’t the norm. For all she knows, some giantess carefully deposited it before hopping down the street for a swim in the Strait of Juan de Fuca. We were on our way to pick up my eldest from her bus stop. I hadn’t dropped her off in the morning, so I didn’t know if the giant purse was a new installation or not. I love the daily stroll home from the bus stop. Often we stop in at our favourite little grocery store for an after-school snack, and we have good chats. Yesterday the shop was stocking treats made by Cold Comfort, a local artisan ice cream maker. We munched on the too-good-to-resist-even-in-cooler-weather coffee ice-cream sandwiched between two vanilla bean macarons as we approached the giant purse. Me: Oh, that’s a giant purse. Wasn’t it there this morning? G: No. That’s definitely new. We then stopped to chat with another art admirer, discuss how it was made, and take a few photos. I made G stand next to the bag for perspective, not that it was really necessary with the houses right behind. After a few minutes we went on our way, the poor baby silently signing “more” as we strolled, because we were in the habit of buying fresh blackberries at the store and feeding them to her on the way home, but blackberry season is over, and we weren’t sharing our Cold Comfort. Conversation turned back to the ice cream. G: Is that all she (Ms. Cold Comfort) does – make ice cream? Me: No, I think she works at Fol Epi too. G: (Gasp.) Best. Life. Ever. The fence is everchanging. Little panels change here and there. Sometimes we notice straight away, sometimes we don’t. I think the star flower piece is one of my all time favourites. I’m not sure this was an intended function of this particular sculpture, but it makes me happy when I walk past it.